How Should I Answer Police Questions When I am Pulled Over for a DUI? Being pulled over by a police officer is a stressful experience. This is especially true if you know that you have been drinking alcohol. Your mind starts racing and you want to make sure that you don’t give the police officer any reason to suspect that you are under the influence of alcohol. Unfortunately, many motorists don’t really think before they open their mouth. They don’t realize that the police are not there to help them. The police have a job to do and their job begins the moment they notice your vehicle. You need to understand what the police officer is doing and how your conduct and your statements can be used against you in court. First of all, a police officer cannot pull over your vehicle for no reason. In a typical DUI, a police officer will notice a driver committing a traffic violation. This could be speeding, failure to stop at a red light or a stop sign, or improper lane usage. Once the police officer pulls over your car, the police officer begins making observations that will provide them with the legal justification to pull you out of the car and ask that you submit to a field sobriety test. In order for a police officer to ask that you exit your car to perform a field sobriety test, the police officer must have probable cause to think that you may be under the influence of alcohol. A mere hunch is not enough. The police officer must have specific articulable facts to justify their suspicions. The police officer will begin making observations as soon as they suspect that alcohol may be involved. If a police officer asks you to exit your vehicle, you should follow the officer’s request. It is not up to you to decide whether the police officer has probable cause to suspect that you may be under the influence of alcohol. The issue of whether the police officer had the legal right to ask that you exit your vehicle is a decision that will be reviewed later on in Court in front of a judge. 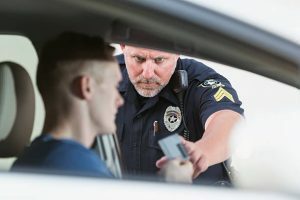 If a police officer starts asking you questions about whether you have been drinking or where you are coming from, you need to understand that the answers that you give to those questions may be used by the Court to review whether the police officer had probable cause to suspect that you have been driving a vehicle under the influence of alcohol. There is no answer to that question that can help you. If the answer to that question is no, and the police officer observes slurred speech, or bloodshot eyes, or an odor of alcoholic beverage coming from your breath, then the police officer will state in his police report that you lied to him about whether you had been drinking alcohol. If you admit to drinking alcohol, then the police officer will note that you admitted to drinking alcohol to help justify his suspicion that you may be under the influence of alcohol. I frequently see clients admit to drinking one or two beers several hours ago, as if such an admission will cause the police officer to let them go. When a client asks me about what they should say to a police officer when they are pulled over for suspicion of DUI, I advise my clients to refuse to answer the question. You are under no legal obligation to answer any questions by a police officer when you are pulled over for suspicion of a DUI. You have a constitutional right to keep your mouth shut and not say something that could be used against you later on in Court. Whatever statements you make to the police officer can be used against you to justify the stop and the subsequent arrest for a DUI. It is perfectly acceptable to tell a police officer that you will not answer their questions about whether you have been drinking or what you have been drinking based on legal advice that you have received from a lawyer. By not answering the question, you will not be providing the probable cause necessary for a police officer to justify placing you under arrest for a DUI. A police officer cannot place you under arrest because you refused to answer his questions. If a police officer tells you that if you answer his questions he will let you go, you need to understand that the Supreme Court has consistently held that the police officer can lie to you to get you to make a statement to them. That same Supreme Court has consistently held that you have the right to keep your mouth shut and not make any statements that could incriminate you. Almost every squad car is equipped with a dash mounted camera which is recording everything that happens and everything that is said during a DUI stop. Increasingly, more and more police officers have cameras on them that are recording everything that is happening. You need to be aware that everything you say, and everything that happens in a DUI stop, will probably be recorded on video tape for use in Court. Do not answer any questions and demand to speak to a lawyer. James Dimeas is a nationally-recognized, award-winning, DUI lawyer. James Dimeas has been handling DUI cases throughout Chicago, Cook County, DuPage County, Kane County, and Lake County for over 25 years. Recently, the American Society of Legal Advocates named James Dimeas a “Top 100 Criminal Defense Lawyer In the State of Illinois For the Year 2018.” James Dimeas has been recognized as a “Best DUI Attorney.” Expertise has named James Dimeas a “Best Criminal Defense Lawyer in Chicago.” The American Institute of Criminal Law Attorneys have recognized James Dimeas as a “10 Best Attorney for Client Satisfaction.” The National Trial Lawyers have named James Dimeas a “Top 100 Criminal Defense Trial Lawyer.” AVVO rates James Dimeas as “Superb”, the highest rating possible for any DUI lawyer in the United States. If you are being charged with a DUI in Chicago, Cook County, DuPage County, Kane County, or Lake County, you can contact James Dimeas anytime for a free and confidential consultation. You can always talk to James Dimeas by calling him at 847-807-7405. Can You Be Charged With a DUI If You Pull Over to “Sleep It Off?, by James G. Dimeas, Chicago Criminal Lawyer Blog, November 9, 2017. Arrested For a DUI. Warnings to Motorist and Notice of Statutory Summary Suspension. What Does This Mean?, by James G. Dimeas, Chicago Criminal Lawyer Blog, August 21, 2017.